Gideon's Guardians: Jumping out of a Perfectly Good Airplane is for Sissies. Jumping out of a Perfectly Good Airplane is for Sissies. Driving a 28-ton armored personnel carrier off the back of a Perfectly Good Ship? 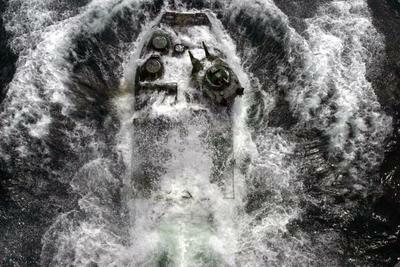 But the whole point of an AAVP7A1 Amphibious Assault Vehicle is that it's supposed to float. Get off the boat and then drive on to the beach and beyond. Of course, it's a bit more difficult if the beach is hostile. See Saving Private Ryan for some idea. I would be more worried if say I was in a 65-ton M1 Abrams tank being taken to shore by a LCAC hovercraft. If anything happens, the tank is making a quick trip to the bottom. I love civil "trial" attorneys! How Can You Represent People Like That? Two Thumbs Up For Sanchovilla!